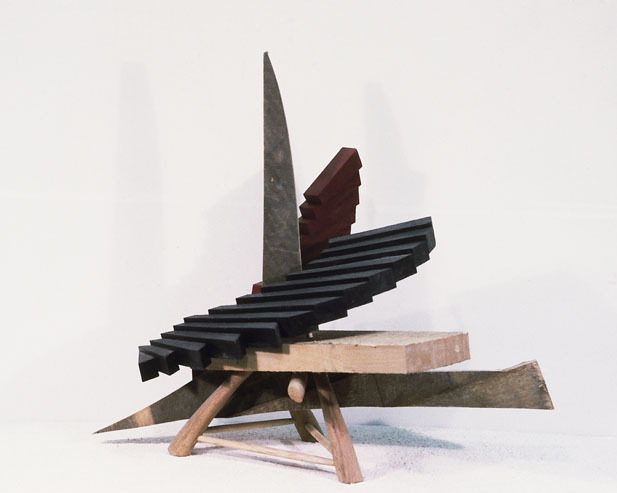 Four pieces were completed in the Columbia MFA program exploring the idea of “morphing sculpture.” Prefabricated parts, made for their own sake in the shop, together with random wood scraps, would be suspended on “legs,” in this case, a tripod emanating from that grouping. An expressive unity would form between the legs and body of the work making the need for a pedestal redundant. With “Prince,” the thrusting parts would be tempered by the controlled arising of curled and extending step-like forms painted red and black. H: 28 in. x W: 31 in. x D: 21 in.